In this section, you will find resources to help you start and implement your assisted transportation service. Resources include relevant research & reports, toolkits, and information pertinent to starting a non-profit or a for-profit organization. In 2016, the MARD Centre developed and launched the Transportation Toolkit with the goal of providing easily accessible and targeted information on implementing or expanding assisted transportation services. 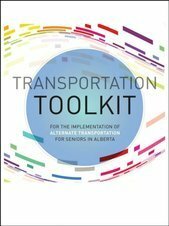 This Toolkit is a great resource to start with, as it aims to provide communities and organizations with the resources needed for the successful development and implementation of sustainable, responsive models of assisted transportation services.